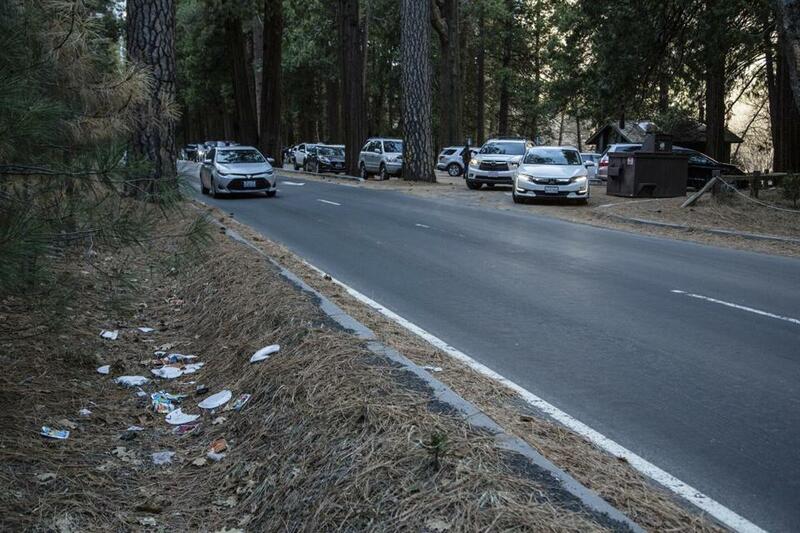 A road lined with trash in Yosemite National Park in California. ‘‘It’s a free-for-all,’’ Dakota Snider, 24, who lives and works in Yosemite Valley, said by telephone Monday, as Yosemite National Park officials announced closings of some minimally supervised campgrounds and public areas within the park that are overwhelmed. ‘‘It’s so heartbreaking. There is more trash and human waste and disregard for the rules than I’ve seen in my four years living here,’’ Snider said. ‘‘It’s really a nightmare scenario,’’ Garder said. ‘‘At the superintendent’s discretion, parks may close grounds/areas with sensitive natural, cultural, historic, or archaeological resources vulnerable to destruction, looting, or other damage that cannot be adequately protected by the excepted law enforcement staff that remain on duty,’’ Barnum said. ‘‘You’re looking at Yosemite Falls and in front of you is plastic bottles and trash bags,’’ he said.